Choose any combination of vegetables. If using chard, blanch first, then sauté quickly with onions. Broccoli also should be blanched. Other vegetables like mushrooms should be sautéed. 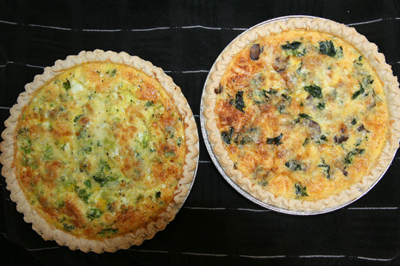 Makes 2 quiches. Preheat oven to 425 degrees F. In a large bowl, whisk together eggs and milk. Season with salt and pepper. Place cooked vegetables in the pie shells. Sprinkle with cheese. Pour egg mixture over cheese. Bake in preheated oven for 15 minutes. Reduce heat to 350 degrees F, and bake for 25 minutes, or until crust is golden and filling is set. Allow to set 5 to 10 minutes before serving.